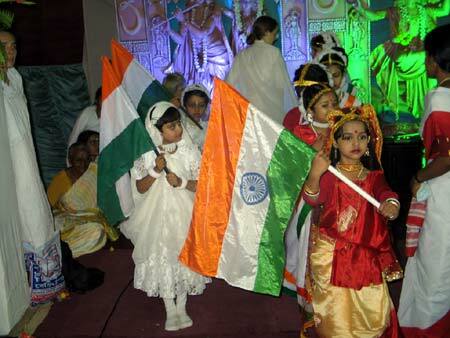 The program in Durgapur ended not long after sunrise. Soon the buses were all loaded and everyone was ready to go on to Kolkata. Ever since darshan had ended, a group of about 100 devotees were waiting around Amma’s car, hoping to see Her off. Many of them held small red roses in their hands. They weren’t deterred by the heat, which, at around 40 degrees Celsius, was considerable. Then just before 4:00, Amma came down from Her room. 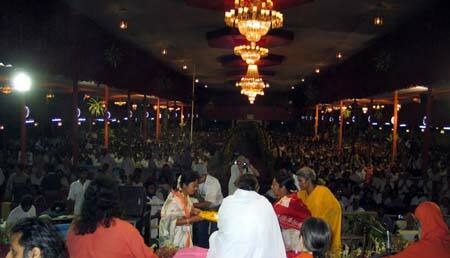 Seeing the Durgapur devotees waiting, She called them all to come into Her arms one more time. Then She got into the waiting car and road off. With so many people helping, the grounds were clean within 15 minutes, and Amma was back in Her car, moving down the road. Driving out of Durgapur, Amma made two “house calls”—a slow drive-by of the new Durgapur Amritakuteeram housing colony currently under construction, and a long walk through the first one, which has been home to 108 families for one year now. As Amma moved around the colony, She picked up babies, handed out prasad and gave people quick, loving embraces. The beneficiaries were very excited to have this special visit from Amma, the one who’d removed them from the roofless squalor in which they had only recently lived. The new Durgapur colony is coming up through a cooperative effort between the Mata Amritanandamayi Math and the local government. The initial phase of the colony comprises 238 houses, with the possibility of a thousand in total coming in the near future. Like all Amritakuteeram houses, the Durgapur homes are given away free to destitute homeless and slum-dwellers. Wednesday, 24 March, Bharata Yatra 2004 — En route to Durgapur. 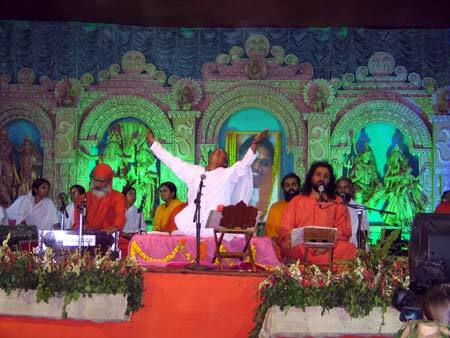 In 2004, Amma gave Her first programme in Varanasi, a place considered by many to be the holiest city in all of India. Built on the banks of the Ganga, Varanasi or Kashi, as it is also known–is famous for its proximity to the river, its Vishwanath Temple and its cremation grounds. It is widely believed that anyone who dies in Kashi attains liberation; so many Hindus relocate there in their final years. The city stands today much as it did thousands of years ago–bullock carts pull people through the streets, sannyasins meditate in the burning grounds, and thousands still come every day to bath in its sacred waters. Very little has changed–except now the river not only carries away half-burnt corpses but also the pollution of many local factories. Amma gave darshan on the grounds of Kashi’s Town Hall, right in the busiest part of the city. The next day, on the road to Durgapur, Amma stopped to have lunch with the devotees and disciples traveling with Her in the yard of an old coal factory. 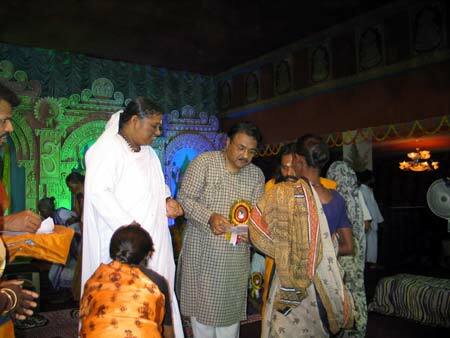 As food was distributed, one of Amma’s Western daughters took the opportunity to ask Her about Kashi. She had always heard so many special things about it, she said, but during Amma’s programme there, she admitted to not having felt any of the city’s legendary splendour. In fact, she mainly found it dirty. Was something wrong with her, she wondered? And what was Amma’s experience there like? Amma then went on to say how so many Mahatmas have done tapas in Kashi, and that the divine vibrations of their austerities resonate there. She also explained that the thousands of people praying every day in the Vishwanath Temple has a powerful effect on the atmosphere. “The atmosphere in the liquor shop is very different than that of the one in a temple–is it not?” Amma asked. But at the same time, Amma said, you must have faith in a sacred place in order to have an experience there. “But for one who has faith in the Guru all the sacred rivers are there at the feet of the Guru,” She said. Explaining the intensity of the faith many Hindus have towards Kashi, Amma explained how in the olden days elderly people would walk there all the way from Kerala–practically the whole length of the country–in order to die in the city. Amma said it would take them more than six months to complete the pilgrimage. “Only when you are thirsty will you come to know the beauty of water. The fish may not know it, because they are in the water all the time. Maybe you are like a fish,” Amma said. Then Amma compared Kashi to Assisi, the town in Italy where St. Francis had lived. Amma said how the citizens of both cities are adamant that the buildings and roads not be changed; they want to keep them the same as they were in the olden days. The only difference, She said, is that they maintain Assisi better than Kashi, and keep it cleaner. Kashi, Assisi, the Ganga–all are made holy by the Mahatmas who’ve graced them. In that sense, had not the coal factory where Amma was sitting become just as sacred? Perhaps, one day, it too would even become a pilgrimage site. Lunch and Amma’s satsang were both finished and everyone began boarding the buses to go on to Kolkata. Indeed, traveling with Amma is a pilgrimage, just one where the pilgrims move with the Goal not to it. 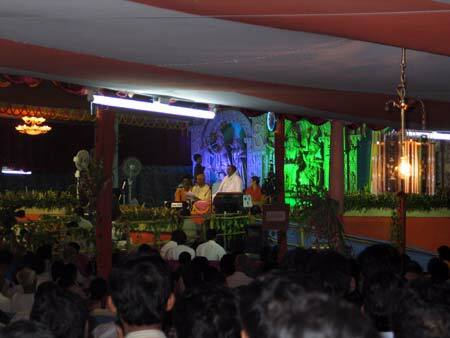 It was dark, but Amma’s face shone clearly in the glow of the portable lamps. She had been singing bhajans in Bengali, but now She wanted a story with a moral, a frequent request of Hers when sitting with Her children. One of Amma’s Finnish devotees stood up and began to speak. She told Amma how at one of the recent programmes, she had become quite depressed. She had started to feel her connection with Amma diminishing; it suddenly seemed to her as if they were strangers. She decided to go near Amma, hoping it would make her feel better, but sitting watching Amma laugh and joke in Malayalam as She gave darshan only intensified Her sense of distance. After a little while, she got up and decided to go outside the programme to have a cup of tea at one of the local chai stalls. Drinking her tea, she suddenly saw another woman about the same age as her rummaging through a pile of trash for food. Almost impulsively, she got up, bought the woman some food and walked over to where she was searching. As she handed the lady the plate, something happened. She told Amma that when their eyes connected, she felt that they had connected. The differences of culture and country fell away. For that moment, they understood each other and were one. And in that connection, she felt her connection with Amma. 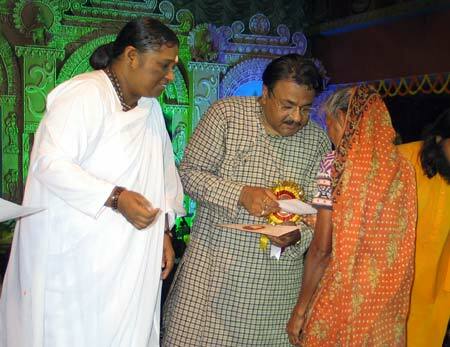 As the lady’s story was translated to Amma, it was clear she was touched. “She was searching for food for the body, and you where searching for food for Atman– the soul,” Amma said. “The attitude of giving will bring the experience of completeness. The compassion will help you in the search. Then Amma explained how our longing for God should have an intensity like one starving for food. When you are starving, first you will beg for food. If you don’t receive any, you will start begging for money. If you don’t get any money, you will resort to stealing. It was way past midnight in the holy city of Varanasi when they entered the darshan line, most aided by walking sticks. In fact, they seemed as old as the city itself: a disoriented-looking lady with incredibly thick glasses, a handicapped woman dragging herself forward by her hands, a blind man guided by his almost-blind wife. They had been brought for Amma’s darshan from the village of Kanchampurkiri, not far from Allahabad, by one of Amma’s devotees. When the first old lady came for darshan, Amma had to bend way over in order to take her into Her arms, as she was suffering from somewhat of a hunchback. The next woman had to be lifted. All around tears were flowing. Amma then called one of Her swamis to come and record their names, addresses and stories, so they could be considered for Amrita Nidhi, the Math’s free pension programme. Through Amrita Nidhi, the Mata Amritanandamayi Math has been providing to India’s poor since 1998, initially in South India. 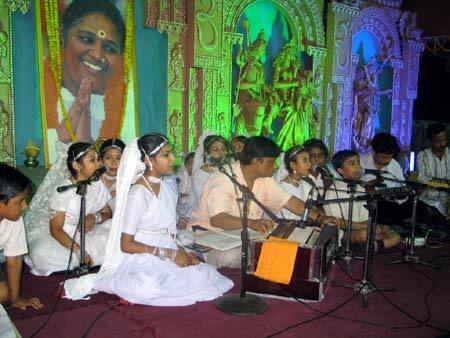 During Amma’s in 2004 North India Tour, the programme expanded to eight other Indian states, including Uttar Pradesh. Beneficiaries receive enough to ensure they get at least one good meal a day. Sahadev is completely blind. His wife, Ranjani, who is also poor-sighted, guides him. She begs for food on the street. “We eat every other day,” she says. “There is no more.” She starts crying as She is telling her fate. They have one son. He drives a rickshaw and has six children. “What can he give us?” she asks. “He hardly makes enough to support his family.” Ranjani starts crying, and then Sahadev starts talking. He has four more daughters, but they all live with their husband’s families. They have not seen them for years and have lost all contact. “It is because we cannot invite them. We cannot even offer them tea or food. How can we receive our daughters then?” Sahadev breaks down and buries his face in his turban. Maana is 55 years old. She is handicapped and has been a widow for the past five years. Her husband was also handicapped, and they were used to a life of begging. Since her sister’s death, Maana also has to care for her mentally retarded niece. They are entitled to a government food ration because of their handicaps, but it is distributed through the village chief, she says, and he gives it to his own family. Sahjina is 85 years old. She still works everyday, seven days a week. From early morning to the late evening she washes vessels and pots in a local restaurant. She earns Rs. 150 a month. She earns so little because she cannot work very hard anymore; so her boss lowered her salary. Panchu works in a shop that sells rice and grains. She sits in a corner all day removing small stones from the rice. For this, her boss pays her only in food; sometimes only half a meal when he feels she has not worked hard enough. Once their stories are verified by the Ashram, Panchu, Sahjina, Sukrana, Maana, Ranjani, Sahadev and Angani will be entitled to be part in the Amrita Nidhi pension programme, which will eventually benefit over 50,000 people. Amma arrived in Lucknow just before dawn this morning, marking the beginning of the final phase of Bharata Yatra 2004: three one-night programs in the cities of Lucknow, Varanasi and Durgapur and then two in Calcutta. This part of India is so rich with history. Lucknow, the capital of Uttar Pradesh, was originally named Lakshmanapur, after Lakshmana, the younger brother of Sri Rama who founded the city thousands of years ago. It is situated only a few hours drive north of Ayodhya, the kingdom of Sri Rama. Tomorrow, Amma will be driving to Varanasi—the city of Lord Shiva, considered by many to be one of the holiest places in India. The Lucknow program took place on the spacious greenery of the Kolvin Talukadar College, under a cool, open sky. The chief guest was Shri. Revati Raman Singh, the Honourable Minister of Transport, who both spoke and helped Amma distribute certificates for free homes in the area as part of Mata Amritanandamayi Math’s Amritakuteeram project. Other dignitaries gracing the dais were Lucknow’s mayor, Dr. S.C. Rai; Shri. Vidyasagar Gupta, MLA; and Shri. Suresh Srivastav, MLA—all of whom helped distribute pension checks to destitute women of Lucknow, as part of the Math’s Amritanidhi program.